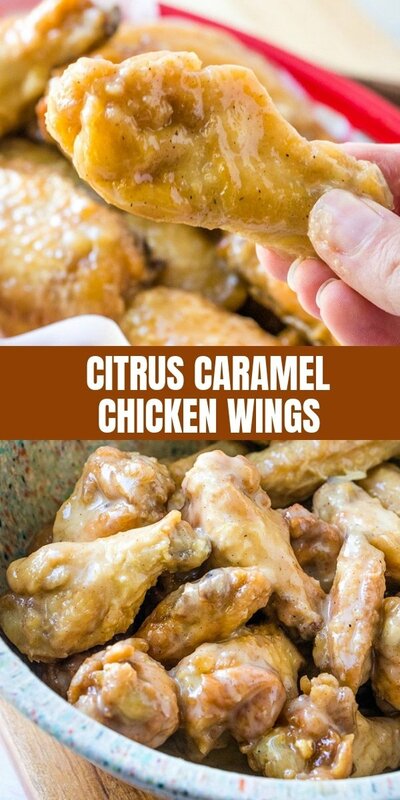 Citrus Caramel Chicken Wings are the perfect party food or dinner meal. 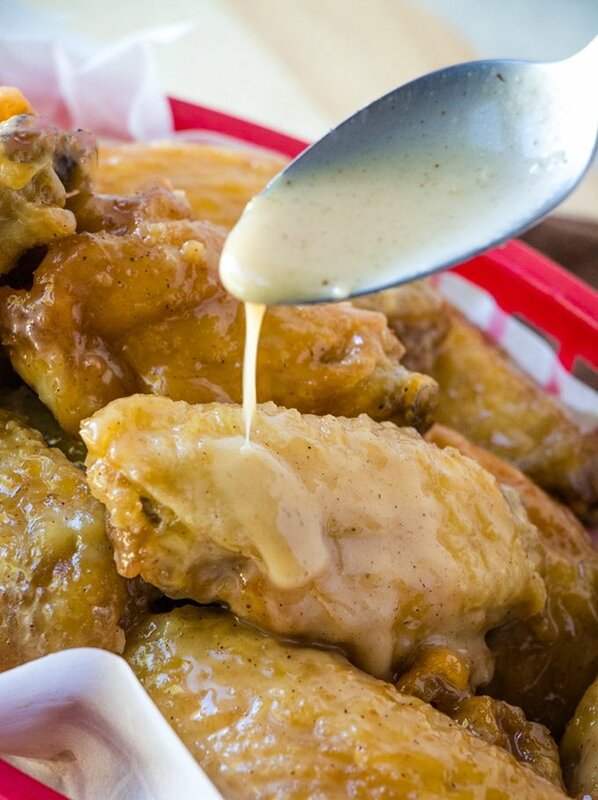 Fried to golden perfection and drenched in a citrusy caramel sauce, they’re finger-licking, lip-smacking amazing. 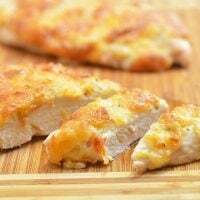 A few years ago, I embarked on a huge undertaking of gathering all my favorite chicken wing recipes into one convenient e-book my email subscribers can download for free. I spent a good couple of months buried in wings and drummettes, cooking and retesting and photo-taking. Unfortunately, the e-book project turned into a grand plan I never got to complete, and it has been sitting in my hard drive half finished for years. 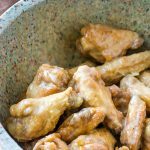 Fortunately, I now have a long line of delicious homemade chicken wings I can pull from the book and post on the blog instead. 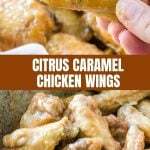 I already have honey soy, mango habanero, and classic buffalo recipes up on the blog but although they’re all finger-licking, lip-smacking amazing, these citrus caramel wings have the most unique flavor profile in my opinion. 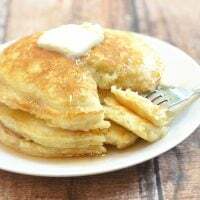 Lightly breaded, deep-fried to golden perfection, and then drenched in a caramel sauce with orange juice, they’re a delicious medley of sweet, creamy, and savory that’s seriously addicting! 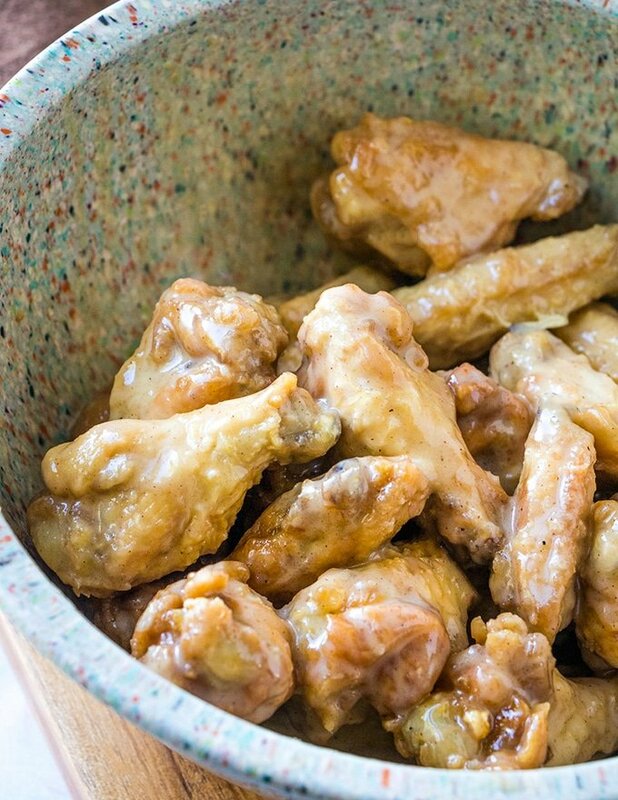 How Do You Make Baked Chicken Wings Crispy? I find deep-frying delivers the best texture but if you prefer to skip the hot oil and trim extra fat, you can make crispy chicken in the oven, too. 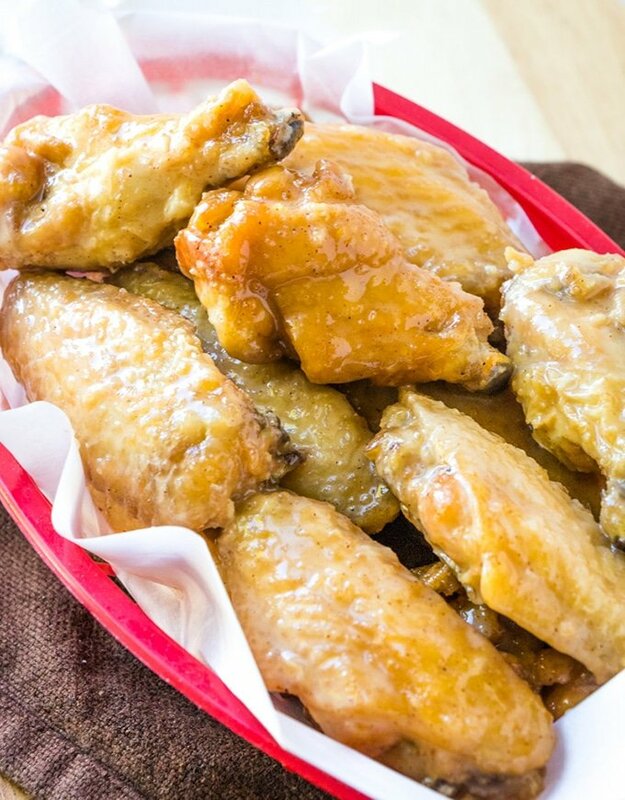 Pat the chicken wings dry with paper towels and dredge in seasoned flour to fully coat. Arrange the wings in a single layer on a baking sheet and chill uncovered in the refrigerator for about 1 hour. Bake in a 400 F oven for about 20 to 25 minutes, flip, and continue to cook for another 20 to 25 minutes or until crispy. 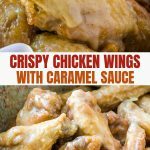 We usually enjoy these wings sans dipping sauce as the creamy caramel glaze delivers plenty of flavors. As part of an appetizer menu, we like to serve them with crudites, parmesan potato wedges, onion rings, and a variety of boneless wings such as this honey chipotle. 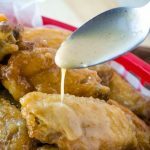 As a light lunch or dinner meal, these wings go really well with smashed potatoes and roasted vegetables or tossed salad. 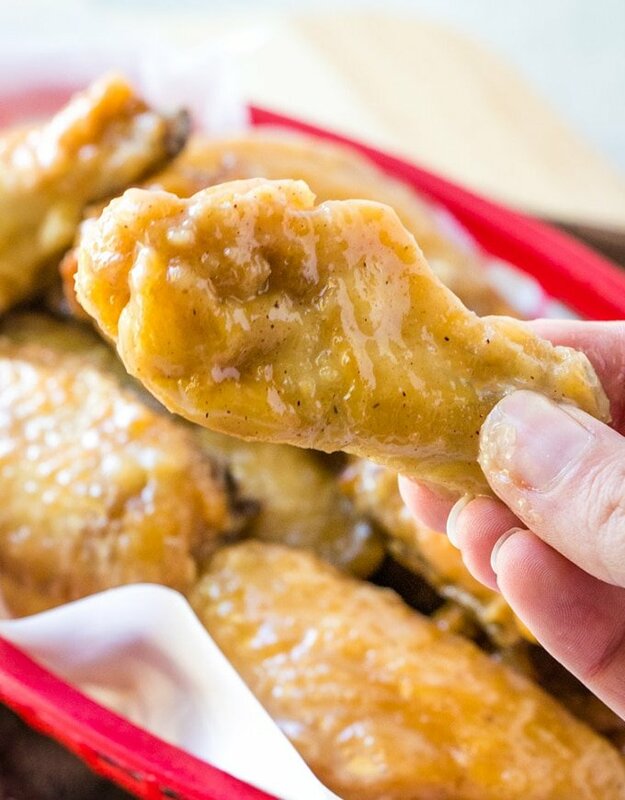 Give this chicken wing recipe a try and make sure to make a big batch as these babies are sure to be a crowd favorite and will be polished off before you know it! 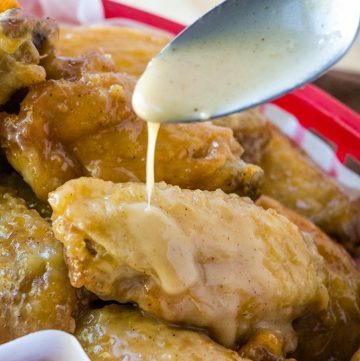 Citrus Caramel Chicken Wings are the perfect party food or dinner meal. 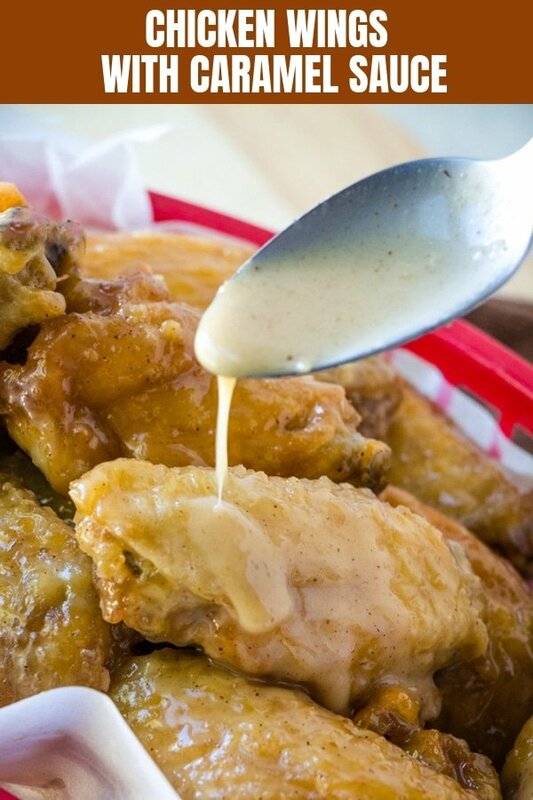 Fried to golden perfection and drenched in a citrusy caramel sauce, they're finger-licking, lip-smacking amazing. 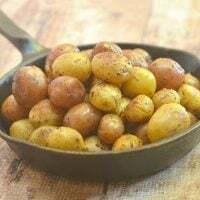 In a bowl, combine flour and salt and pepper to taste. 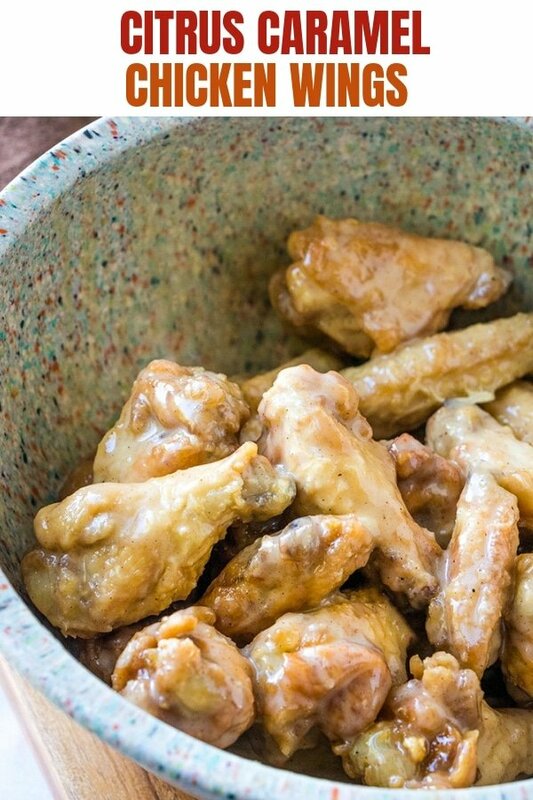 Dredge chicken wings in flour to fully coat. In a pan over medium heat, heat about 2-inches deep of oil. Add chicken in batches and deep- fry, turning as needed, for about 10 minutes or until golden brown and cooked through. Remove from pan and drain on paper towels. In a saucepan over medium heat, melt butter. Add orange juice and heavy cream, stirring constantly. Stir in cinnamon and nutmeg and continue to cook for about 1 to 2 minutes or until sauce is thickened. 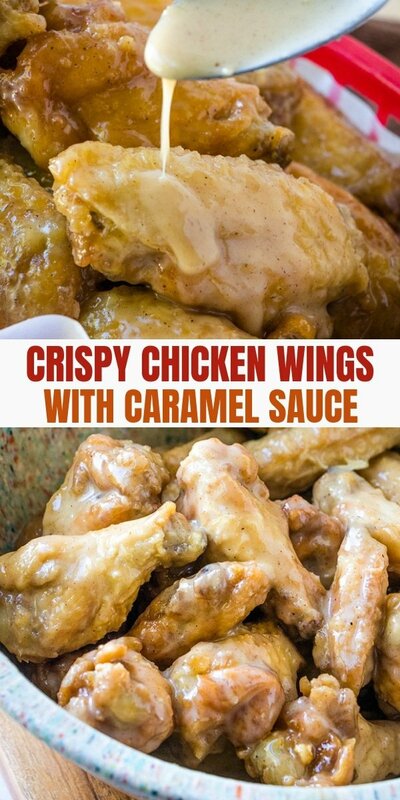 In a bowl, toss the chicken wings with the citrus caramel sauce. Serve immediately. I discovered this blog along with Kawaling Pinoy, and feel that I have dug up a treasure! I love your humor, your clear, no-nonsense, and instructional style, and of course (! 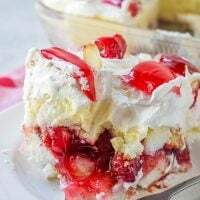 ), your creative recipes.